The 426 Series Check Valve design promotes multiple configurations to fit the exact end use application. Gray PVC with 1 psi stainless spring and ball is the standard configuration. PVC is a NSF Standard 61 Approved Material. Nylon and Glass Filled Polypropylene are available for chemical resistance applications. MakroBlend is an NSF Standard 51 Approved Material. Hastelloy is a superior chemically resistant spring material. Teflon® balls are standard with Hastelloy springs for chemical resistance applications. The 426 Series Foot Valve design promotes multiple outlet end configurations to fit the exact end use application. The inlet end is a 3/8" Hose Barb with a 40 Mesh Stainless Suction Strainer screen installed. Gray PVC with 1 psi stainless spring and ball is the standard configuration. PVC is a NSF Standard 61 Approved Material. Nylon and Glass Filled Polypropylene are available for chemical resistance applications. MakroBlend is an NSF Standard 51 Approved Material. Hastelloy is a superior chemically resistant spring material. Teflon® balls are standard with Hastelloy springs for chemical resistance applications. 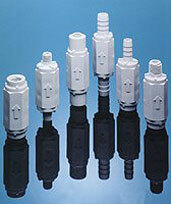 The 685 Series Poppet Check Valve incorporates a thin elastomer disc supported by a poppet that seals on the seat. Pressure in the flow direction moves the seal off the seat first before pressure builds enough to move the poppet away from the seat. The 685 Series Check Valve maximum operating pressure of 125 psi covers a wide range of air and fluid applications. The 685 Check is a compact design with a light cracking pressure, high flow rate, and a positive seal at very low back pressure or slight vacuum. For higher cracking pressure applications, an embedded o-ring poppet is substituted for the standard elastomer disc poppet. The 687 Series Poppet Check Valve incorporates a thin elastomer disc supported by a poppet that seals on the seat. Pressure in the flow direction moves the seal off the seat first before pressure builds enough to move the poppet away from the seat. The 687 Series Check Valve maximum operating pressure of 125 psi covers a wide range of air and fluid applications. The 687 Check is a compact design with a light cracking pressure, high flow rate, and a positive seal at very low back pressure or slight vacuum. The 693 Series Poppet Check Valve incorporates a thin elastomer disc supported by a poppet that seals on the seat. Pressure in the flow direction moves the seal off the seat first before pressure builds enough to move the poppet away from the seat. The 693 Series Check Valve maximum operating pressure of 125 psi covers a wide range of air and fluid applications. The 693 Check is a compact design with a light cracking pressure, high flow rate, and a positive seal at very low back pressure or slight vacuum. For higher cracking pressure applications, an embedded o-ring poppet is substituted for the standard elastomer disc poppet. 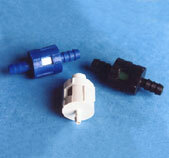 The 694 Series Poppet Check Valve incorporates a thin elastomer disc supported by a poppet that seals on the seat. Pressure in the flow direction moves the seal off the seat first before pressure builds enough to move the poppet away from the seat. The 694 Series Check Valve maximum operating pressure of 125 psi covers a wide range of air and fluid applications. The 694 Check is a compact design with a light cracking pressure, high flow rate, and a positive seal at very low back pressure or slight vacuum. For higher cracking pressure applications, an embedded o-ring poppet is substituted for the standard elastomer disc poppet. "Check Valves with Brains". This is how the manufacturer, Balta Corporation, describes their products, and we agree. Balta's spring loaded plastic check valves feature a circular groove design, an aerodynamic entrance and a tapered radius seat, which make it one of the very top products of its catgory. Choice of cracking pressure from 3 inches water to 15 PSI; choice of chemically resistant materials; choice of threaded and barbed ends. Made by Balta Corporation, specialized in designing, developing and manufacturing high quality versatile fluid power products at competitive prices.